Bed Bug Exterminator, Pest Control NYC, Brooklyn exterminators, NYC Bed Bug Removal, Pest Control in Manhattan NY, Queens exterminator, Exterminating Company in Long Island NY, Nassau County and the Bronx NY. Magic has been a leader of bedbug removal solutions in New York City, Queens, Bronx, Brooklyn, and Nassau County. Bedbug Magic Exterminators can take care of Bed Bug problems in New York City, Manhattan, Queens, Brooklyn, the Bronx, and Long Island. Exterminating Bedbugs is a Magic speciality - our exclusive bedbug treatments have achieved excellent results! Magic Exterminating has been serving New York City and Long Island for almost 50 years and in that time we have never experience a pest explosion like bedbugs. Ten years ago, we received no calls for bed bugs and now they are a daily occurrence. It does not matter where you live; Manhattan, Queens, Brooklyn, the Bronx and Long Island are all affected equally. Magic has been at the forefront of this epidemic and has developed protocols that are unique, that other exterminators do not offer. Steam treatments, mattress encasements and highly trained teams of technicians that exclusively treat bedbugs are some reasons Magic has achieved such excellent results. We also utilize several treatment methods and explain each step of the process during our initial inspection and estimate. With bed bug infestations on the rise all New Yorkers should familiarize themselves with this pest; early detection makes treatments less intrusive and more effective. 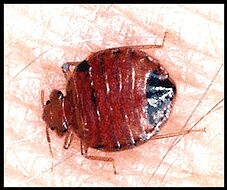 Magic Exterminating has included some information from the University of Kentucky regarding bedbugs. If you suspect bed bugs in your home or apartment, call or email one of our pest control experts and understand the true meaning of the childhood rhyme. "Sleep tight, don't let the bedbugs bite."